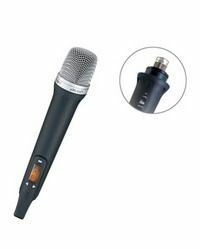 EJ-700DR series is a UHF band, PLL synthesized diversity wireless microphone system, equipped with 4 receiver modules in maximum. With pre-programmed 96 selectable frequencies make it easy to choose available interference-free channels. Simplified and understandable operation design makes this unit highly user-friendly. 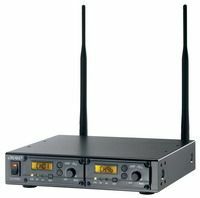 UHF band 640 – 865 MHz, PLL synthesized with 16 (863 – 865 MHz) or 96 (640 – 664 MHz, 740 – 752 MHz, 794 – 806 MHz) selectable frequencies, for multi-channel / multi-purpose application. LCD window, LED indicators and backlit for better comprehensive operation. Simplified design makes it highly user-friendly by UP, DOWN and SET button. Compact and economy unit, only 1/2 U in size. Optional L-type bracket available for mounting in a rack. Balanced XLR connectors and unbalanced 6.3mm jack available for different purposes. Tone-key squelch available to eliminate external noise. UHF band 640 ~ 865 MHz, PLL synthesized with 16 (863 – 865 MHz) or 96 (640 – 664 MHz, 740 – 752 MHz, 794 – 806 MHz) selectable frequencies, for multi-channel/ multi-purpose application. LCD window shows selected channel, frequency, battery condition, and error code. Four different colors of rear-caps to identify a particular microphone on stage. Steel microphone head-grill designed for avoiding pop and wind noises. Adjustable Hi/Low/Mute sensitivity available for professional application. High efficient transmission and low battery consumption. UHF band 640 ~ 865 MHz, PLL synthesized receiver module with 16 (863 – 865 MHz) or 96 (640 – 664 MHz, 740 – 752 MHz, 794 – 806 MHz) selectable frequencies. LCD window indicates frequency and channel.